Format: A4 portrait, 80 pages, with 199 good-quality colour photos and 1:35 plans from Dirk Degenhardt. The text is in German and English. Format: A4 portrait, 56 pages, with 112 good-quality colour photos and 1:35 plans from Dirk Degenhardt. The text is in German and English. Many thanks to Ralph Zwilling for the sample books for this review. 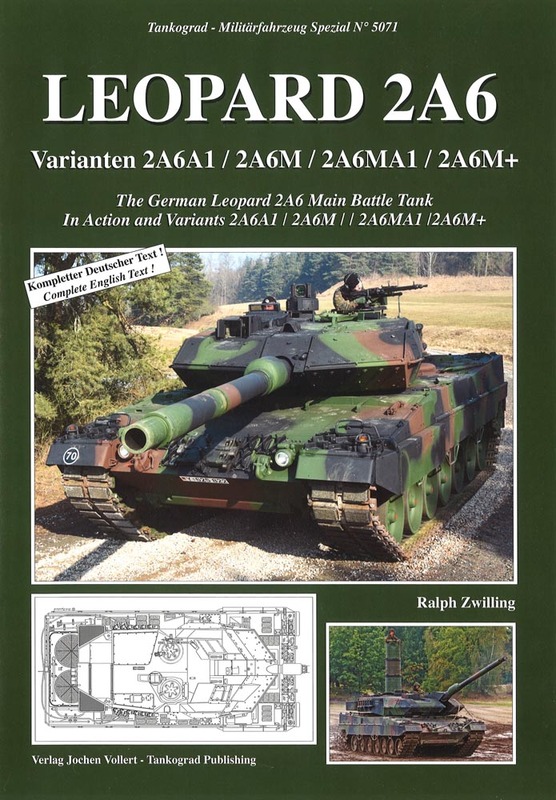 Ralph Zwilling and Tankograd has already published a book about Leopard 2A7. These two new books about 2A6 are a reverse follow-on from this title. More books in the series will continue to look back at Leopard 2 history in the future. 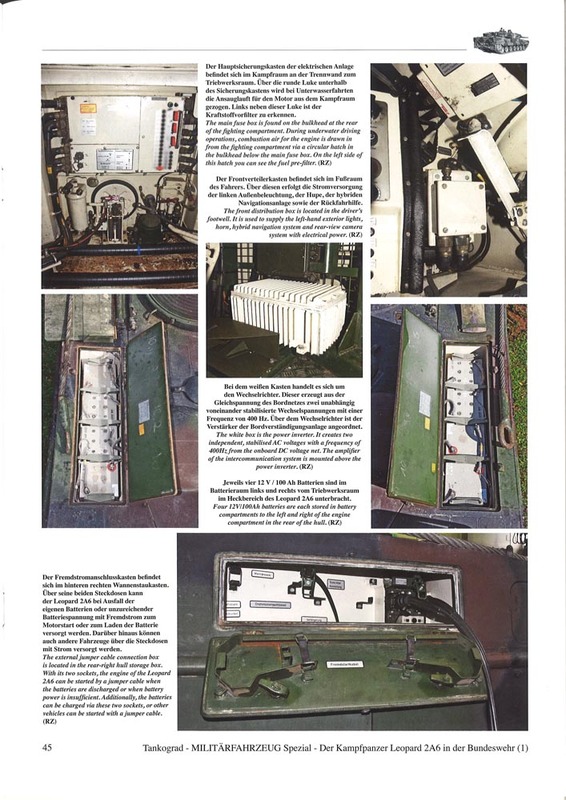 To quote the back cover copy: Much has been published about the quantum-leap technology of the Leopard 2A5 and recently about the state-of-the-art Leopard 2A7. Yet in the meantime the Leopard 2A6 main battle tank has developed into the most versatile and furthest modernised family of vehicles of the whole Leopard fleet. Aside from its main variant, the 2A6, improved versions such as the 2A6A1, 2A6M, 2A6MA1 and 2A6M+ have been fielded and make this family the most advanced technology carrier of the modern Panzertruppe. 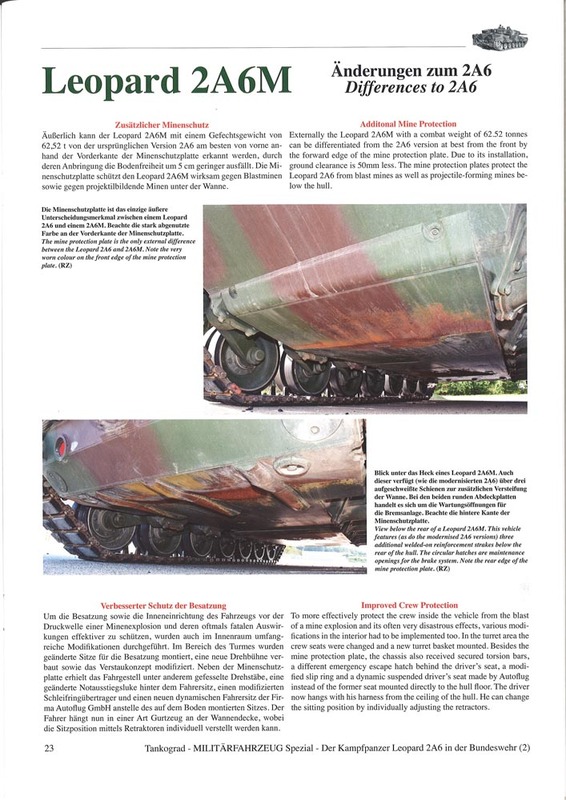 In unprecedented detail, this publication shows the tank's development, technology, variants and active use. 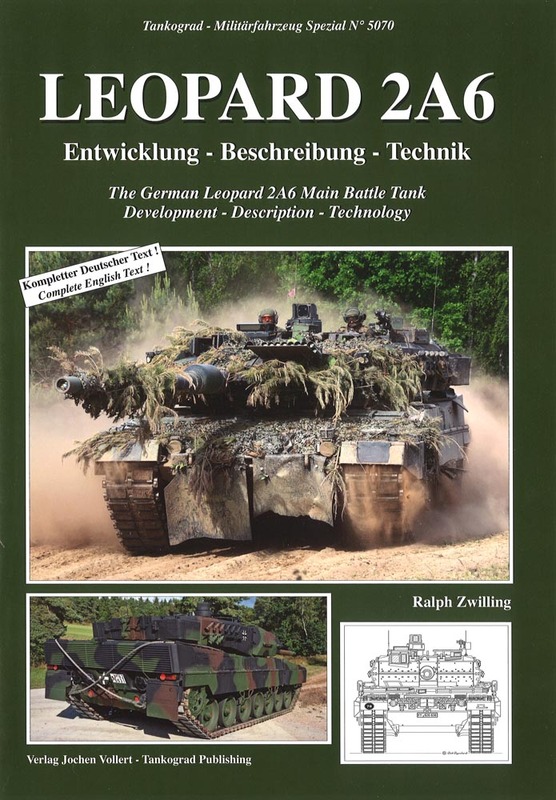 In two volumes with a total of 140 pages, 311 colour photos, 21 graphics and no less than three 1:35 scale drawings it permits the closest look at modern German main battle tank technology ever published. Although this has been published as two titles, I will treat this review as if this is one book. It is a shame that this isn't, indeed, just one book. You will notice from the headings above that this is a very technically-based pairing of books. Having said that, both books make for interesting reading as they delve more thoroughly into these tanks than anything that has gone before. They are well written and researched and not-at-all dull reading. 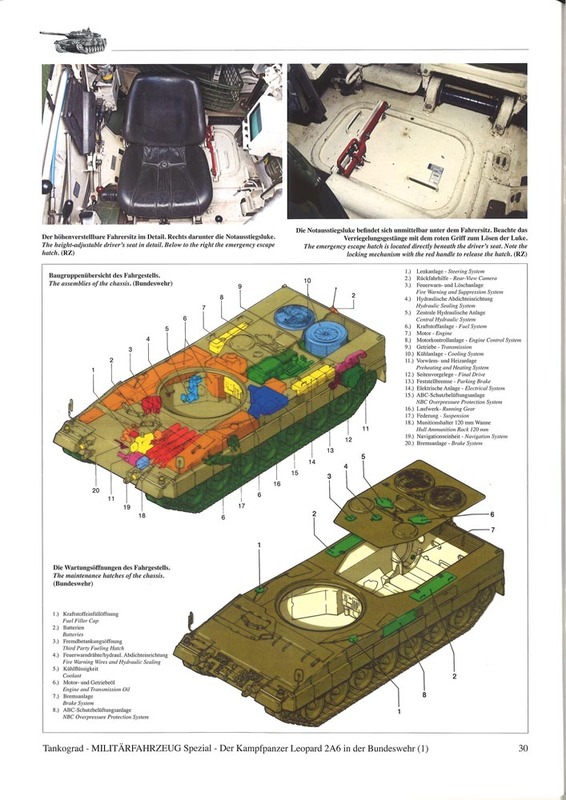 The first 13 pages take an interesting look at the evolution of the Leopard 2, which is surprisingly complex. 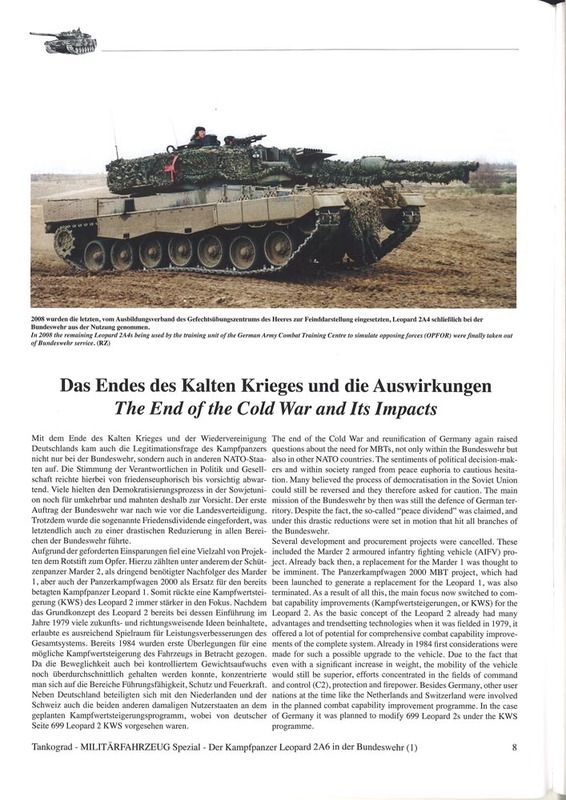 From the failure of the joint German/US Kpz70/MBT-70 programme and the need for a Leopard 1 replacement, Leopard 2 evolved from the lessons learned from both of these tanks. Early Leopard 2 prototypes looked like scaled-up Leopard 1A3/1A4 - which seems to confuse some people as they are easily misidentified as such. This is certainly not the case and following the Yom Kippur War in 1973 between Israel and its Arab neighbours, lessons were quickly learnt that increase in armour protection had become more important. 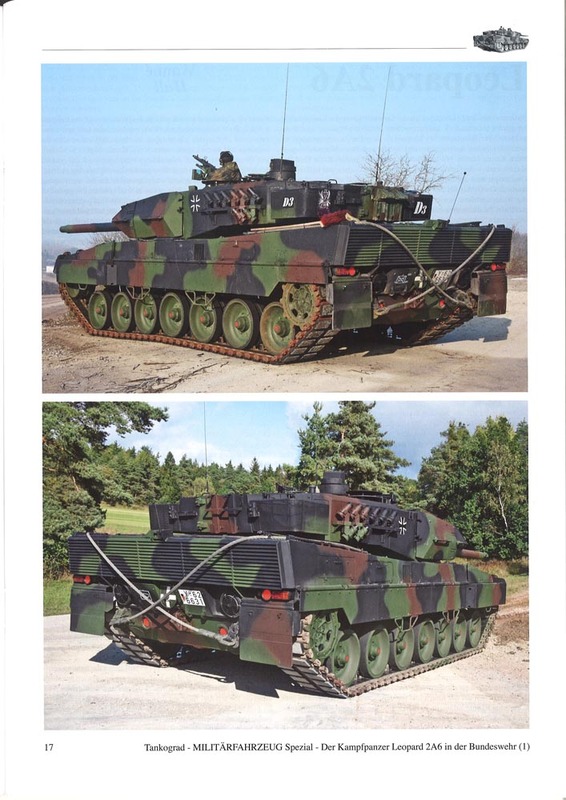 This heralded the change from the sleek, angular First Generation Leopard 2 prototypes to the now, more familiar, Second Generation prototypes and pre-production Leopard 2s with their vertical-sided hulls and turrets. 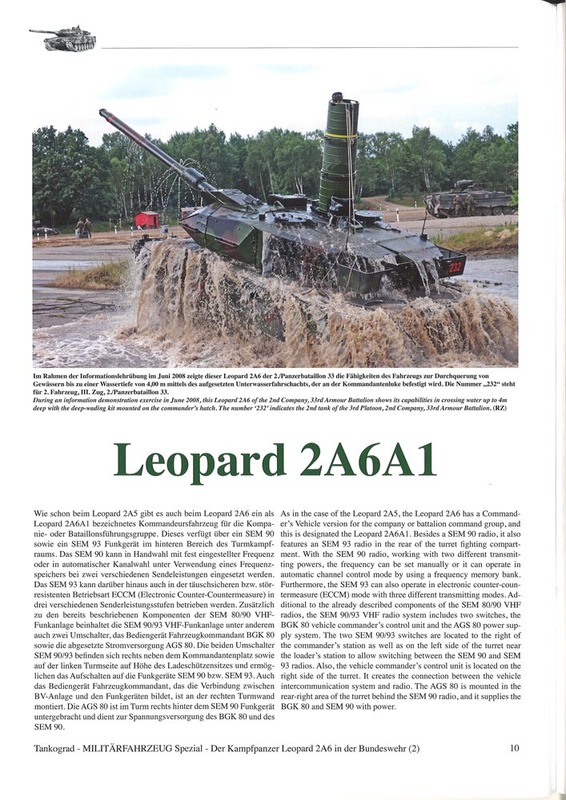 Production of Leopard 2 is dealt with, before the end of the Cold War impacted with further developments which led to combat capability programmes resulting in Leopard 2A5 and the subject of these books, 2A6. It is worth remembering that Leopard 2A6 has been in service since 2001, so it is already an old stager. 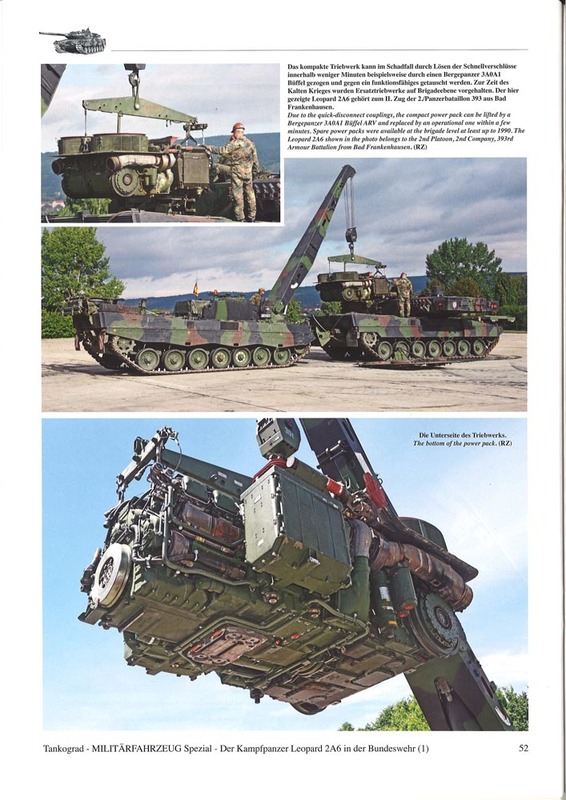 If you consider that Leopard 2 was introduced into service in 1979, with the last 2A4s being delivered in 1992, it is amazing how Leopard 2 has kept pace with the latest developments in MBT technology. 2A6 is, of course, a direct decendent of 2A4 and 2A5, with all them being converted from the earlier tanks. 2A5 and 2A4 will be the subjects of forthcoming books. These introductory pages are very interesting and clearly written. The majority of the book is then taken up with walkaround photos showing overall views and more detailed shots of the subjects in the list above, interspersed with five pages of 1:35 line drawings. All are described with German/English text and photos. Most photos are two to a page, with additional pages featuring up to seven or eight photos. All of the photos include short captions in German and English. Some manufacturer illustrations, complete with keyed information, are included for more clarity. One thing I do not like is that some of the interior control panels have been blurred out in the interests of security. This is perfectly understandable, of course, and the layouts of the panels can still be recognised. 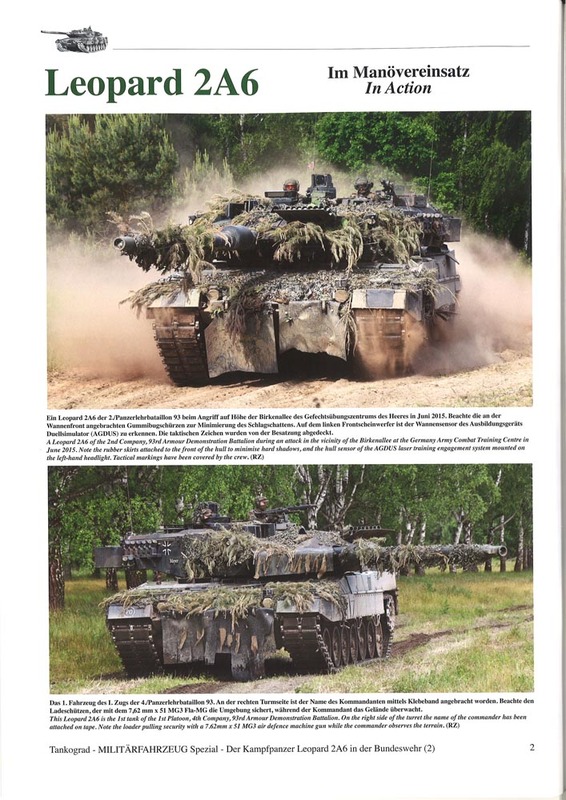 In this shorter book (56 pages as opposed to 80 pages in the first book), we see the Leopard 2A6 in action during various exercises over the years. Thanks to more lessons learnt in operations such as KFOR in Kosovo, it was realised that more protection from mines would be necessary, hence the development of Leopard 2A6M. One criticism of this book is that three pages include 1:35 drawings of the 2A6M. 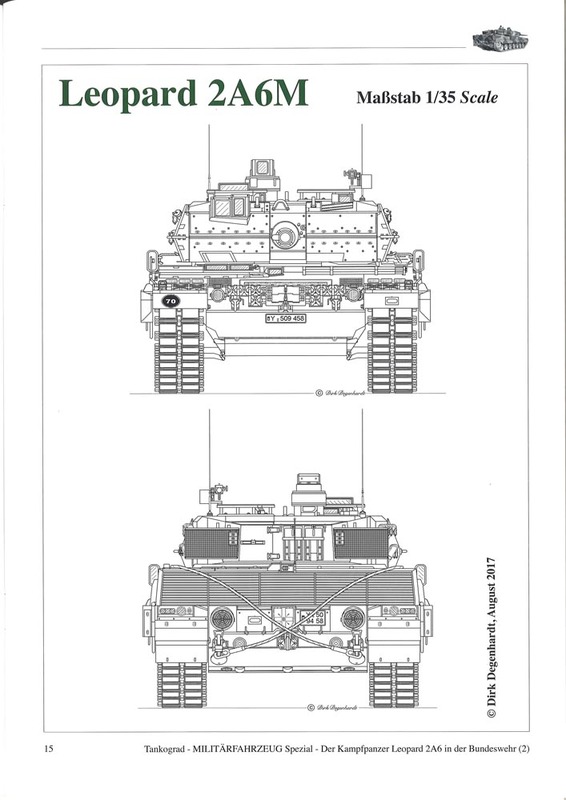 Only the front and rear of the vehicle shows any differences, while the left, right and plan views are totally identical to the 2A6 drawings in the previous book. This could have mentioned as a note in the front/rear view page and following 2 pages used for more photos instead of identical drawings. We than have more In Action photos of 2A6M this time and detailed walkaround shots and descriptions of the differences to 2A6. 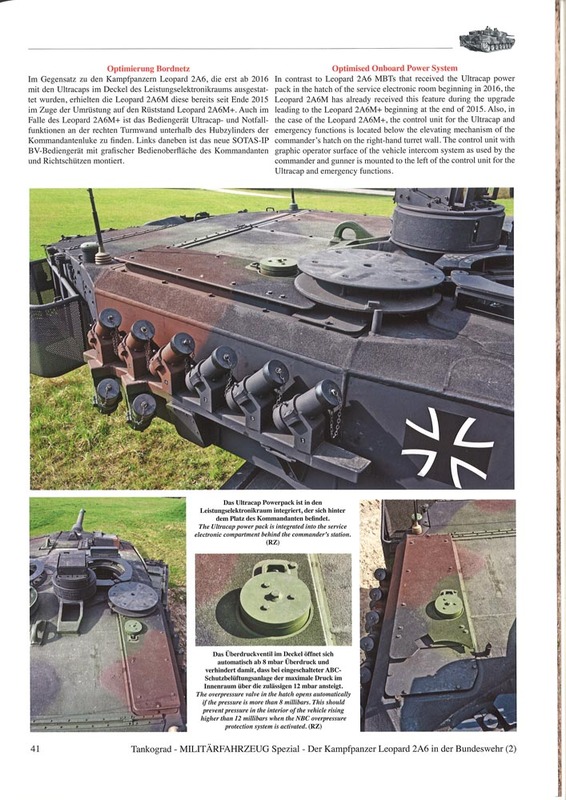 Apparently, the interior photos of the 2A6A1 are the first to have ever been published. Ralph told me!! 2A6M+ then gets the same treatment - in action plus detail photos and descriptions. The future Leopard 2 programme is described, complete with a table of numbers of which version will become which variant in the future. 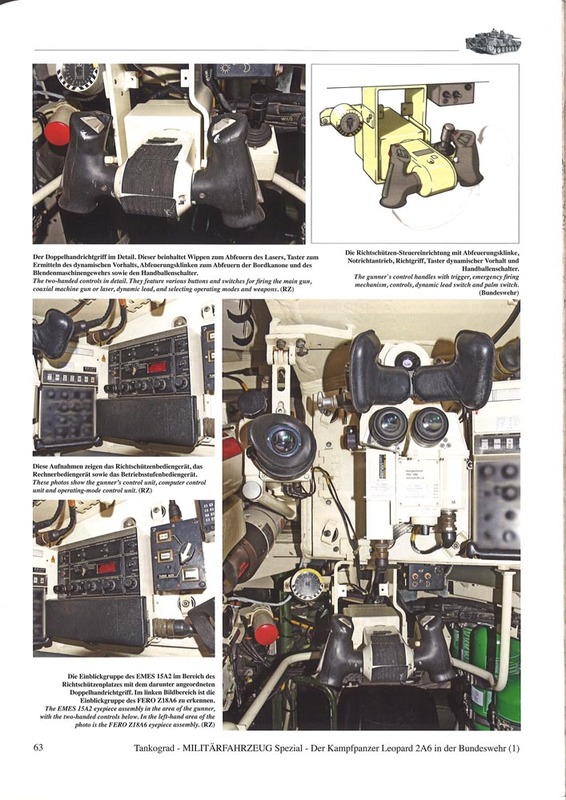 This is followed by technical specs of the tanks and the study is completed with a brief look at the roles of the individual crew members, without whom the tanks would be nothing. 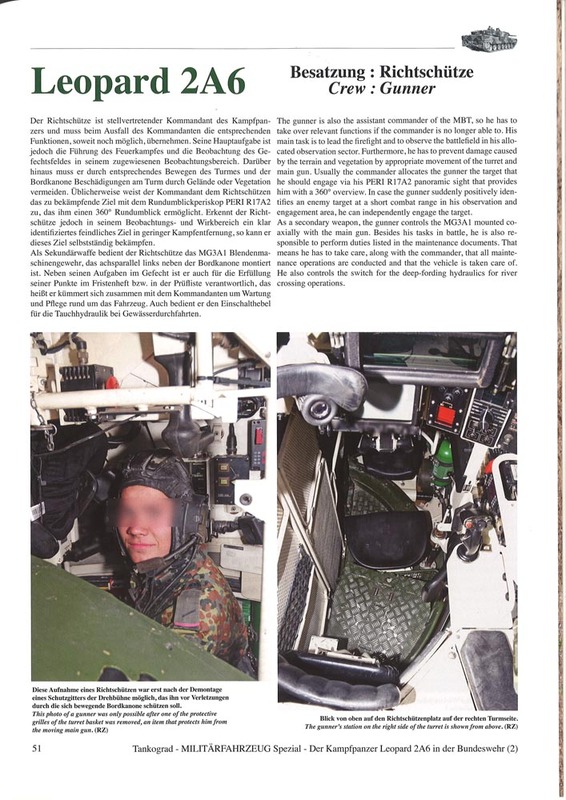 It is very obvious that the author has been given access to the latest Bundeswehr equipment and has spent a lot of time crawling around the tanks and compiling these books. This brings the subject matter bang up-to-date, at the time of writing. I highly recommend both of these books to any Leopard fan or anyone interested in modern armour. We look forward to the follow-on books in this series.